This was probably the favorite part of this RoadTrip for all of us. Ever since my hike "back in time" to Six Penny Lake area, in July of 2009, I've been wanting to get the girls back to this mini Shangri la. I knew they wouldn't enjoy the Hike in, and definitely not the Hike out - so I checked maps and found the old access road to what use to be the day use area. It has just enough parking for two or three cars where it meets the main road. Boulders lined up block entry any further. 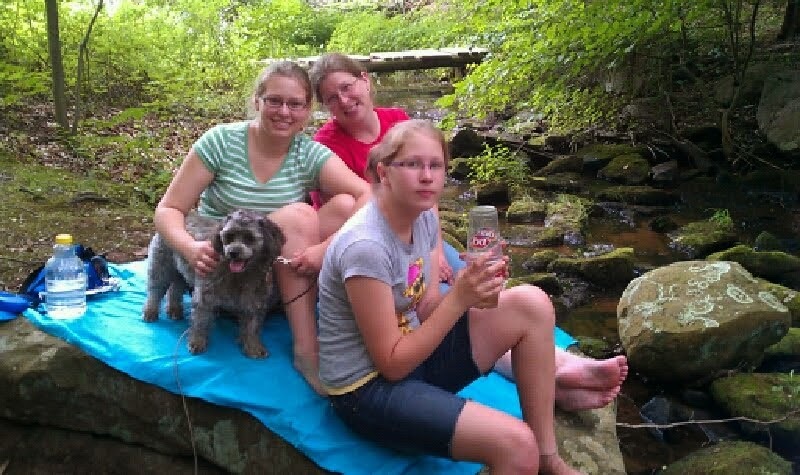 The girls didn't seem too enthused by the idea, but E was sold on the idea of catching some salamanders, which is what Frank use to do with me in this area when I was a boy. Once Amy had joined us, I talked up the idea as well, and we headed out for our unusual 4th of July Picnic with a few snack crackers, bottles of water and a neat sheet. Molly was along as well. I guess, I'm not the best map reader - but how did I miss that the access road I wanted was off one main road - not the other? It's not like there are a lot of roads out here to choose from ! =p After a few turn-arounds, Amy got me to the right place. We walked in - with all the girls wary of the poison Ivy along the old macadam road - now just a walkway. We walked the gentle slope downward and came to the small concrete bridge - and suddenly you could feel the difference - the coolness - in the air. You could smell it too - as if there were somehow more oxygen in this place. We continued - now following the gentle babble of the water upstream. A Salamander. Never "officially" caught the little guy, but found him in a feeder stream, but he wiggled out of my muck-covered fingers. E said she did see him before he vanished into the mud of the bank. Glad she did get that at least. Three Crayfish - or Crawdads. E caught them all, in shallow still-water pools alongside the stream. We watched them for some time - and I was able to show how they swim backwards - something the girls didn't know before. A Leopard Frog. E caught him as we clamored up by the dam, with some herding assistance from me. Muddy Mess I was! the Frog, however, was quite quick and lively and E got to give him some close up looks through her Clear "DQ" cup she used as trap, habitat, and observation area. Minnows. Well, they look like minnows, but we have a tendency to call any fish smaller than our pinkie "a minnow". Never successfully caught one in our cup. They were Quick! Was nice to share the experience of "hunting our prey" with E. Hope she enjoyed just as much. 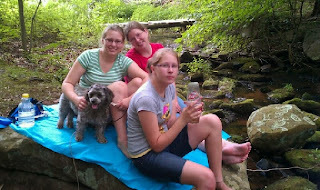 We enjoyed a small snack and water, and just relaxed and chatted stream-side. I was surprised no other hiker ever ventured past. What was Molly doing during this adventure? She's not really a wading dog, so she mostly sat near Amy, with perhaps a foray stream-side to see what the girls were up to. She did find a stick or two to pass the time. I think she enjoyed this relaxing spot as well. We finally decided to head back after a few relaxing hours enjoying the stream together. This was not one of our most active 4th of July's - But one of the most memorable ones.